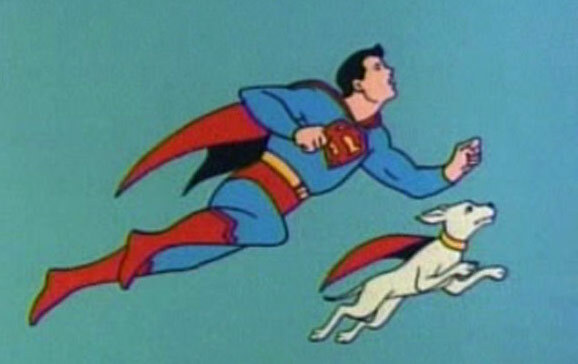 For a number of years, Filmation’s kitschy DC superhero cartoons from the ’60s have been widely available on disc and for download — except for The Adventures of Superboy. Batman (both 1968 and 1977 versions), Superman and Aquaman have all been out there. So have the “super superhero” guest shorts featuring the Atom, Flash, Green Lantern, Hawkman, the Justice League of America and the Teen Titans. In any event, the series, which originally ran in tandem with The New Adventures of Superman, is finally available again. Thing is, you can only get it in once place — the recently launched DC Universe app — and the 18 first-season episodes remain missing. DC Universe posted the cartoons with zero fanfare — and you’d be forgiven for not being able to find them easily if you’re a subscriber: They’re attached to the Season 2 and 3 New Adventures of Superman cartoons that appeared on the app in the last week or so. My eagle-eyed son noticed them last night. 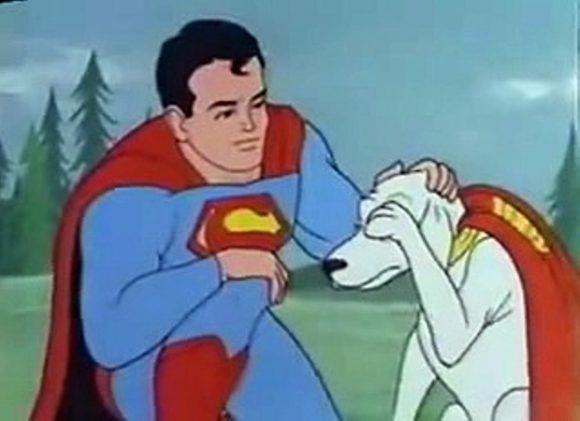 That’s OK, Krypto. You’re a very good boy. What amazes me, though, is that Aquaman, the cartoon that helped an entire generation discover the Swift and Powerful Monarch of the Ocean, is still not on the app. You’d think that with the Jason Momoa movie a blockbuster, DC Universe would throw everything it could at you. But at least his adventures are readily available. And so, finally, are Superboy’s. Or at least about half his cartoons. For info on DC Universe, click here. — 13 GREAT THINGS About Filmation’s BATMAN Cartoons. Click here. It’s OK that they ccome with the Superman episodes as that is how they were originally seen. Still would love them all on DVD to complete my DC filmation collection. IF Warner Brothers can’t be bothered to produce a DVD set, why don’t they sublet it out to somebody like Shout Factory to do it for them. Shout constantly takes on big projects that the big studios can’t be bothered to do. WB would just sign-off on it, Shout would do all of the work, and WB & Shout would share in the profits. It’s a win/win situation! If they were going to be put out on any DVD set, they should’ve had them released on the Adventures of Superboy sets years ago. But even those weren’t given official releases after Season 1. They’re MOD with no extras. But now DC’s streaming site wants to tout it as one of their shows.